“Love and tolerance of others is our code” (Big Book 84). I am not a very lovely and tolerant person. I’m just not. I try my darnedest, but… no. Quiet, though, I have improved upon. Pausing when agitated. Walking away. Not engaging. This morning, though, I woke up to yet another email explaining to me the fallibility of AA. Ugh. When I posted last week that this conversation bores me, a man called me a coward. He said that since his opinion differed with mine, I was scared to acknowledge him. Nothing could be further from the truth. I am sorry he feels spurned or neglected or failed or whatever it is by AA. I know such feelings exist. I just… I don’t know what to say about it. I know there is a lot of hostility towards AA out there. And I know some people feel the need to express their dissatisfaction, but let me set something straight, once and for all. This is my blog. I write it. I draw the pictures. Its about my life, my perceptions, my recovery. I make no bones about it. I’ve have my reasons for breaking my anonymity. I wrote about them in in my post Part Three: Why I Write about my Alcoholism: (https://annkroger.com/2014/09/26/part-three-why-i-write-about-my-alcoholism/) But this, this is not a Celebrate Recovery blog. 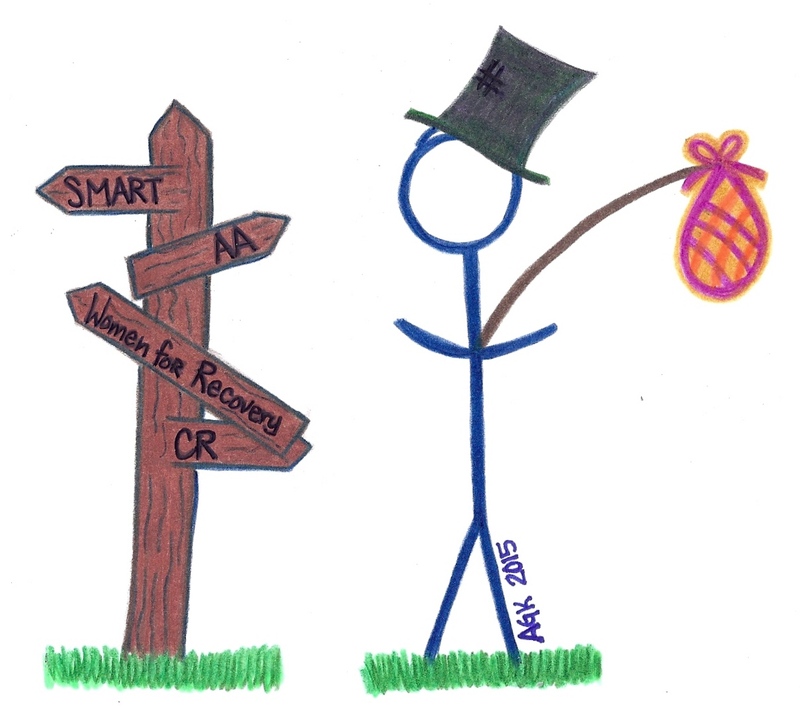 It is not a SMART Recovery Blog. This is not by the sheer force of willpower blog. And I do not feel in the spirit of equanimity that I have to give equal time to any of them because my blog is not about the many forms of recovery from alcohol and drug addiction. It’s about my recovery from alcohol and drug addiction. And I’ve chosen AA. With that said, I have never once said any other approach does not work. I never would. I have no basis on which to judge anything. I have not looked into them. I do not know what their methods are. I do not know what they teach. I’m not a coward; I’m just busy. I have two jobs, two dogs, this blog, my art, a family, a wedding to plan, and a fiancé who just had open-heart surgery. I have neither the time nor the interest to participate in a discussion that affects my life in no way whatsoever. Furthermore, I find it odd that anyone would even engage in that discussion. The Big Book tells us, “In all probability, we shall never be able to touch more than a fair fraction of the alcohol problem in all its ramifications. Upon therapy for the alcoholic himself, we surely have no monopoly,” (xxi). I have a more than a couple friends in Celebrate Recovery. I have friends in SMART recovery. I, as well as most of my friends, engage or have engaged in some form of therapy/ psychoanalysis. Many AAs are on some kind of medication for anxiety or depression or any number of things. AA says some of us may need outside help. It encourages hospitalization when needed. Well… the sun is nice and high. I’ve had a cup of coffee. Writing this has cleared my mind and my mood has drastically improved. So, here is what we’ll do. I will make a one-time offer. If you send me an email at agkroger@gmail.com summarizing your program of recovery, regardless of what it is, I will post it. Explain the program’s advantages or why you like it. Whatever you want. I would prefer it if you did not criticize other programs, but simple tell us about yours. I will not edit it. I will not voice an opinion. If you want to send original artwork, I will post that as well. This is your chance to voice whatever it is you want about whatever it is you are doing. I will accept emails until hmmmm… April 5th and I will post the blog on April 12th. I hope everyone has a great day.